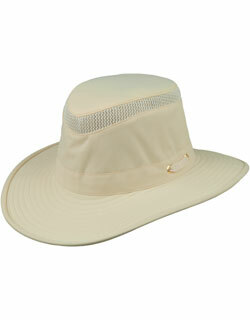 Made with a light canvas and a mesh crown, this hat offers protection and comfort in the hottest weather. The brim and crown top are composed of tough canvas. The flexible mesh crown allows you to stow the hat in the tightest spots. The brim is bound with brown trim. A braided brown leather band matches the trim around the brim. An adjustable cotton stampede string wraps around the crown and passes through two grommeted holes in the brim. Fabric sweatband. Reinforced brim with flexible wire. The brim is 3¼ inches on the front and back, 3 inches on the sides. The crown is 4 inches at the front, sloping down to 3½ inches at the back. Made in Australia. BC Hats was founded by Bill Conner, who created Australia's original leather hat with a shapeable brim in 1969. His unique construction method and use of light weight leather revolutionized the Australian hat industry. For over forty years, BC Hats has created quality hats with innovative designs. These hats are handcrafted in Byron Bay, Australia.